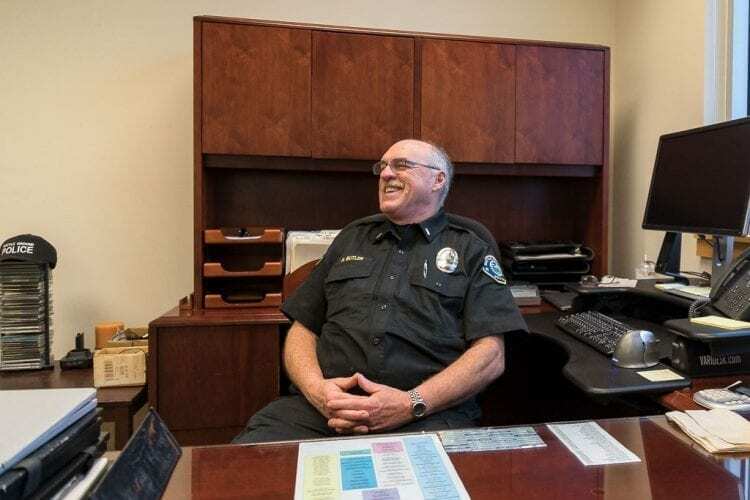 BATTLE GROUND — Battle Ground Police Lieutenant Roy Butler will retire from a 25-year tenure with the Battle Ground Police Department today, concluding a career in law enforcement that spanned 40 years. Butler was honored by a formal public ceremony during the Jan. 16 Battle Ground City Council meeting. Today (Fri., Jan. 26), a reception will be held in Butler’s honor from 4-6 p.m. at the Battle Ground Police Department, and the public is encouraged to attend. Prior to his working with the Battle Ground Police Department, Butler served the Mason County Sheriff’s Office from 1978 to 1993, and left that force with the rank of sergeant. He came to Battle Ground in 1993 at the rank of lieutenant. Prior to his career in law enforcement, Butler served four years in the Air Force in the early 1970s. When he was in high school in California, Butler said that he participated in a police cadet program which helped him decide to pursue a career in law enforcement. While in the Air Force, Butler said that he worked in law enforcement, and that it was a “natural progression” to work in the same field upon leaving the military. “It’s just something that I’d always wanted to do,” Butler explained. Before leaving the Mason County Sheriff’s Office, Butler had attained the rank of sergeant, and worked in that position for a little over three years. However, he said that the position left little room for promotion. All of his superiors were his age and had been with the force for similar lengths of time. Butler said this left little room for advancement in any short amount of time, so he began to look for other work opportunities. In 1993, the Battle Ground Police Department had begun to hire new police officers in anticipation of future growth. Butler said that approximately 60 applicants applied for the job opening, and when hired he became the eighth officer on the city’s police force. “For me, it was a promotion and an opportunity to expand into administrative roles,” Butler said. Since coming to work as a lieutenant with the Battle Ground Police Department, Butler said that there have been many changes. When he was first hired, the city had approximately 4,000 residents, and Butler said that there was usually only one police officer on duty at any given time. At that time, Butler said that it was rare for the department to receive more than one call during an eight-hour shift. Most of the calls were for community care taking or service, not major crimes. However, as the population in the city began to grow, so too did the number of calls received by the police department. Butler said that the obvious solution was to hire and recruit more officers. However, he said that to improve efficiency, the increase in officers needed to be accompanied by an update in technology. Over his career in Battle Ground, Butler witnessed changes and implementation of new technology to help make the job of a police officer in Battle Ground more effective and efficient. For example, when he first joined the department, the department’s patrol cars did not have mobile computing, all information was collected by hand on paper. The cars were also equipped with VHF radios, which while Butler said were a good system, it was essentially technology from the 1960s. However, Butler said that it also requires officers that are comfortable with technology. Luckily, Butler said that newer and younger officers have been raised in an environment where technology was common. However, he said that it was a challenge having experienced officers transitioning to new technology. With the growth of the population and the police department, another significant change during Butler’s time in Battle Ground was an increasing complexity of the job of being a police officer in the town. “The positive is to see the quality of the officers that we have and the service commitment that they have to the community,” Butler said. He also said that the community in Battle Ground is very supportive of its law enforcement personnel. Butler said that one of the highlights of his career in Battle Ground has been knowing that the department has the support of the citizens. “That support has been earned by the hard work of the men and women of the police department,” Butler said. He also said that watching the support grow has been rewarding, as has watching younger officers grow and develop in their careers. For Butler, the ongoing support of the community for the Battle Ground Police Department makes the city unique. Butler said that the officers have worked very hard to maintain a positive relationship with the public. He hopes that in the future, as the city grows and so does the department, that the police department does not lose its sense of service to the community. Battle Ground Police Chief Bob Richardson has been with the Battle Ground Police Department for seven years, and has worked with Butler the whole time. He spoke highly of the service Butler has provided to both the department and the city. “There isn’t anybody that cares more about this community or the police department than he does,” Richardson said. Richardson called Butler an invested member of the police department, and as the second in command, “he’s the one that makes this place run.” Not only did Butler oversee the day-to-day operations of the department, Richardson also said that his long career in Battle Ground allowed him to bring historical knowledge to the police department. “He’s going to be missed because that is a big hole to fill,” Richardson said. Butler was honored by a formal public ceremony during the Feb. 16 Battle Ground City Council meeting. On Fri., Jan. 26, a reception will be held in Butler’s honor from 4-6 p.m. at the Battle Ground Police Department, and the public is encouraged to attend.